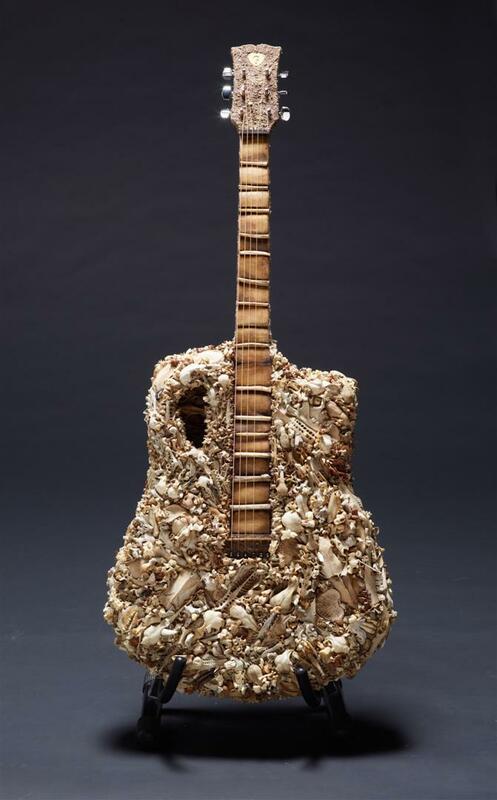 The first bone guitar is a collaboration between textural bone artist – Bruce Mahalski and guitar maker David Gilberd of Goldbeard Guitars. It is an acoustic slim body, steel string(6) dreadnought (1030mm long) which has been handmade by Goldbeard from spruce and mahogany. The front and sides of the instrument has been covered in a layer of textured bone, the neck is covered in trimmed cow ribs and the bones of various birds.. 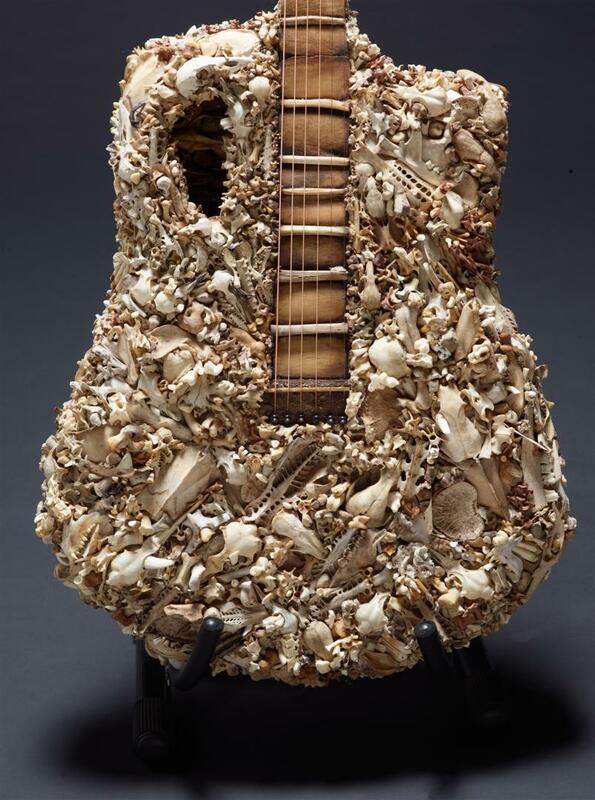 The back of the guitar is covered in crushed bone from assorted animal skulls. 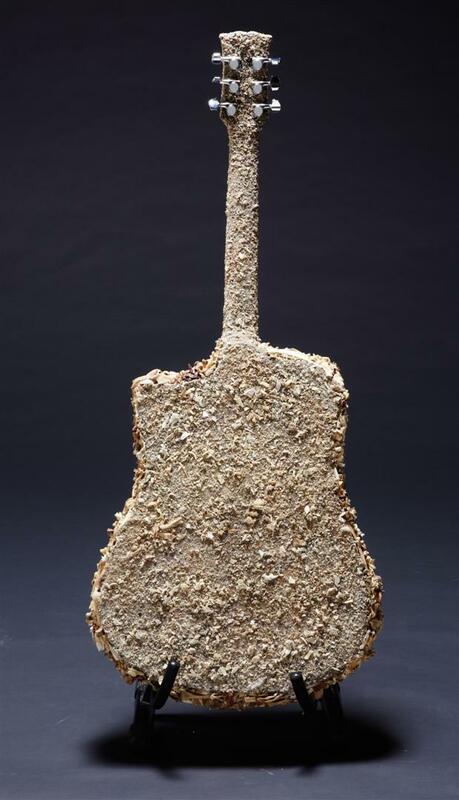 The guitar is a work of art and is not designed for everyday use. It does play but despite the bone frets it is effectively a fretless model which can only be played using a slide. You can watch a video clip of musician John Costa playing it on You Tube here. It has also recently been featured in the Guitar World magazine, Feb 2014. It has about 35 skulls on it including hedgehog, stoat, weasel, rabbit, rat, magpie, hawk, gull, possum, pukeko, duck, sparrow , thrush, sting-ray and part of an extinct moa’s jawbone. It also contains bones and teeth from cat, dog, sheep,wild pig, cow, wallaby, swan, seal, and snapper. You can visit Dave and Bruce and see the guitar in The Real at Nautilus Creative Space, Owhiro Bay. Wellington, New Zealand. Please email first to make a time. Or you can see more of our latest works virtually at Mahalski Bio-Technologies and Goldbeard on Facebook.